If you like Batman and need socks then this is what you need. 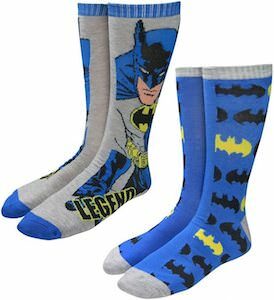 This set includes 2 pairs of socks one pair is gray with on it Batman himself and the word “Legend” because that is what Batman is and the other pair of socks is blue with on it in black and yellow the Batman logo. So you can now have two pairs of Batman socks and it could be even fun to mix them up so that you wear one sock of each pair as they look great together. These Batman socks will fit men’s shoe size 6 – 12 and will make you feel a bit more like a superhero.